A few months later, she announced she was pregnant with her first child. (A girl, or so the ultrasounds say so far.) I don't remember who suggested the idea of turning these unfinished squares into a quilt for her baby, but it seemed right and perfect. I took the squares but wasn't sure what to do. The fabrics are old, but I don't know how old, and they have that aged cream-and-tan patina that only comes with aged cotton. Modern prints would look out of place and jarring, and white would only make the fabrics look even more aged than they already were. Instead: unbleached muslin. Clean, simple, inobtrusive. 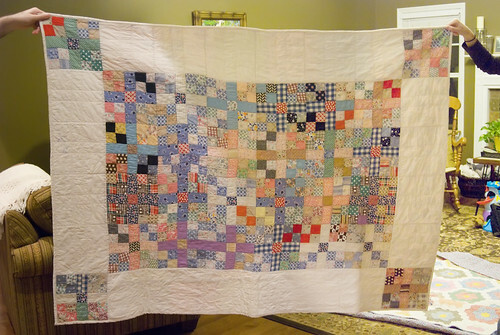 The story of this quilt is more important than the fabric I put with it. Plus -- 29? 29 didn't work well in any configuration. I opted to pull out four squares for corners, and not use one square. That left me 24 squares, a 4x6 grid. Perfect. Use unbleached muslin to finish out the design and call it done. The back will be splashier. Something fun, bright, modern. Later on, this girl will be able to choose which side she wants to see: cheery, bright Girl Scout fabric or the more muted colors of fabrics pieced together by a not-too-distant ancestor. Lucky girl. We should all start out life with something like this.